While some colleges struggle to fill seats, the country’s most selective ones are becoming harder to get into. Seven of the eight Ivy League schools reported they lowered their acceptance rate for this fall, with Harvard leading the pack by accepting less than 6% of its more than 30,000 undergraduate applicants. As we’ve noted before, perhaps the only student program more difficult to get into than Harvard is the Cato internship program. This summer we were able to accept 4.9 percent of the more than 800 applicants for internships. The program’s rigor is similar to the Ivy League, too. But, unlike the Ivy League, Cato interns receive a broad and deep education in the fundamentals of liberty. Each intern is assigned to policy directors at Cato, allowing the intern to delve deeply into a particular area of study. Not only do the interns help Cato scholars with research and work with the conference department to organize policy conferences, debates, and forums, but they attend regular seminars on politics, economics, law, and philosophy, as well as a series of lectures and films on libertarian themes. The interns develop their public speaking skills by presenting policy recommendations and develop their writing skills by drafting letters to the editor and op-eds. After such intense study, they emerge at the end of the summer well equipped to promote and live the ideas of liberty. Find out more about Cato internships here. Note that the internship program is year-round, and the process is a little less competitive for Fall and Spring internships. We encourage students to consider applying in any season. The deadline for Fall internship applications has passed, and the deadline for Spring is November 1. Congress is dominated by intellectual lightweights who are chiefly consumed by electioneering and largely irrelevant in a body where a handful of members and many more staff do the actual work of legislating. And the business of the institution barely gets done because of a pernicious convergence of big money and consuming partisanship. That is Robert Kaiser’s unsparing assessment in “Act of Congress,” the latest volume in a growing body of work lamenting our broken capital…. In the passing of Dodd-Frank, the public interest—however that might be defined—often took a back seat to money, special interests and political expediency. It did not help, notes Mr. Kaiser, that many members of Congress are politics-obsessed mediocrities who know little about the policy they’re purportedly crafting and voting on. Indeed, it is Mr. Kaiser’s frank and often scathing criticism of Congress that enlivens a book that might otherwise strain the attention of anyone not intensely interested in the regulation of derivatives…. What makes “Act of Congress” especially valuable is its detailed portrait of Washington’s influence peddlers and, in particular, the powerful aides who script their boss’s statements, write the bills and often become lobbyists themselves after leaving the government payroll. Big money, small politicians, and the lobbyists and staff running the place: It’s hardly a new story about Washington. But Mr. Kaiser names names and spares no one. So the question is, If you understand just how poorly most legislation is crafted, if you understand the corruption and ignorance that go into making rules for 300 million Americans, why are you still wedded to the idea that inevitably ignorant and corrupt people should make rules for everything from health care to banking to retirement to drug policy? Both Jeffrey Friedman and Ilya Somin have written for the Cato Institute, and in Somin’s forthcoming book, about the problem of public ignorance and value of a much smaller and less centralized government that could depoliticize decision-making and limit the scope of errors. Faith in government, like a second marriage, is a triumph of hope over experience. I’m delighted to report that Miss Liberty’s Guide to Film is available again—on Kindle. My friend Jon Osborne worked for years on this project, but the 2001 book has been out of print for years. It’s the best available guide to movies with libertarian themes, with more than 250 short reviews. What are the best libertarian films? 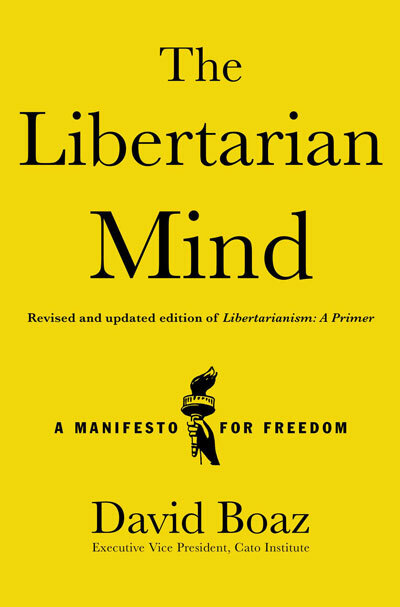 Well, the book doesn’t rank them, but some that make his list of Top Libertarian Films are Amistad, Animal Farm, Fahrenheit 451, Shenandoah, and We the Living. Libertarians may be familiar with all of those, but he also recommends the lesser-known Cash McCall, East-West, Improper Conduct, and many more. No such list is exhaustive, of course, or uncontroversial. When I listed some of my own favorite libertarian-themed films, I included some that Osborne doesn’t: So Big (1953) and My Beautiful Laundrette. Not to mention the republican Gladiator and the anti-Nazi, anti-communist Sunshine, both released in 2000. Few if any of these movies are like libertarian essays on film. Osborne includes movies that have such themes as anti-socialism (under which he includes anti-National Socialism), anti-war, bureaucratic abuse of power, creator as hero, freedom of speech, individualism, social tolerance, and voluntaryism. Each film is rated for both its libertarian content and its entertainment value, and also briefly reviewed. Osborne mostly stopped reviewing—and maybe even seeing—movies when his daughter was born, so there aren’t many movies here from the past decade. But from All Quiet on the Western Front (1930) to Rabbit-Proof Fence (2002), there are enough movies here to keep you busy for the rest of the year. When Americans suggest that government transfer programs might affect the way people vote, the mainstream media react with the indignation that greeted Mitt Romney’s “47 percent” comment. Of course, in other contexts the media certainly know that programs like Social Security, Medicare, and farm subsidies impact voting, but Republicans seem to get pounded for making that point. Frustrated by delays in Parliament, and eager to gain favor with rural voters ahead of national elections, India’s cabinet has approved a sweeping executive order that establishes a legal right to food and will create what is likely to be the world’s largest food subsidy system for the poor…. For the governing Congress Party, the new ordinance fulfills a campaign pledge made by Mrs. Gandhi and provides her party with something tangible to offer voters as the country prepares for national elections next year. The coalition government has been battered by corruption scandals and a sinking economy. With polls suggesting a loss of public support for the Congress Party, the food ordinance is good politics, some analysts say, if uncertain economics. Trying to rekindle the fire of India’s economy, Finance Minister P. Chidambaram promised Thursday to rein in a runaway deficit even as he raised spending on welfare schemes that the government hopes will woo voters in elections scheduled for next year…. Chidambaram promised to increase spending on rural welfare schemes, rural roads and jobs, food guarantees for the poor, women’s safety programs, tax breaks on loans for first-time home buyers and a women’s bank. Is it really so hard to imagine that American politicians might also see transfer programs as measures that would benefit them on election day? Of course, the more fundamental impact of transfer programs may be to make both parties afraid to cut spending. What politician in either party wants to propose cuts in Social Security, Medicare, student loans, or farm subsidies? It’s not that transfer recipients all vote for the same party; it’s just that both parties fear the loss of votes if they interfered with the flow of subsidies. And not just in India.